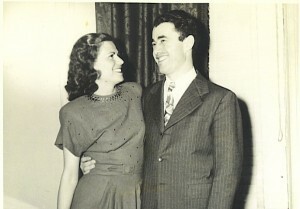 Grandma Esther & Grandpa Al, about 2 years after her liberation from Auschwitz. Before that, Esther Herskovitz was a bright, active young woman with bad hay fever, living near the Czech border in a small town in a big house with an orchard and a vineyard and a large, warm family, all of which have since vanished, literally, into thin air. Except the allergies… and my grandmother. Still, my grandmother talks about it. She tells us stories and gives interviews (like for Spielberg’s project over a decade ago) and does not keep secrets. She lost sisters, brothers (there were 11 siblings before the war, from which only three, Esther and her brothers, Shalom -who left Europe before the war – and Joseph emerged), nieces, nephews, aunts, uncles, cousins, and her parents. Those came with her into Auschwitz but not out. But she has never lost her sense of humor or her dignity or her ingenuity or her sense of morality and purpose. Those came out of the wreck just fine. Tell that to the Pilgrims of Victimhood at Durban II in Geneva. Mass suffering of nations and races is an old scourge of humanity. It is tragic and it is worth discussing, as a world community. Preferably, grand scale human rights abuses should not be a cause to be championed by people who actually abuse their own people (like, say, Ahmadinejad) while getting very upset that others, elsewhere are being mistreated. But I digress. The politics of blame and the Free Pass for Generations of Rage granted to the underdog (again, as long as he is not your underdog) by the third world, otherwise known these days as the UN, is not helping anyone. Except the leaders of those oppressive countries, who are pulling off some pretty nifty diversionary tactics for the benefit of their abused masses. What if they were to instead tell people to become doctors to heal each other, lawyers to fight for their causes in the world’s courts, or film directors, to bring their stories to light? Why give your sons a gun, a black mask, and a suicide belt, when you could give him, instead, a hug and a ticket to study in Dubai? Why build bombs when you could have built a university, a hospital, or a hi-tech park? Why dig smuggling tunnels when you could instead build a subway system to take you to see relatives in Cairo? Why is there no Palestinian or Somali or Pakistani version of the JNF or Hadassah? There would certainly be enough Euros in aid and Saudi oil dollars coming in to fund them, if anyone local cared to organize those efforts, instead of blaming You-Know-Jew (again!) for all of the earth’s problems. Because you have been oppressed. Because you are poor. Because you’ve had relatives killed. Are not good reasons. Not since the 40′s. Not since ever, really. To me, these sound like the Bad Childhood Defense that pops up like a fungus in the American legal system when the guy on trial has nothing else to explain away his depravity. As if everyone who had a funny uncle or a mother who loved Jack Daniels more than Daddy couldn’t help it if he took some liberties with the neighborhood’s kids. Where is the sense of moral responsibility that most of us carry, whatever else we went through? Isn’t this the whole point of a legal system? And – by the way – since when is this a “conservative” idea? Isn’t rising above and making the most of one’s circumstances supposed to be a spiritual, Eastern, fundamentally liberal concept? And yet… somehow many yoga-soaked leftists have pushed away the idea of responsibility, of moral culpability – both on an individual and national level – even though responsibility for the self and for one’s own spiritual development, as well as responsibility for the other, are at the core of humanitarian philosophy. Compassion has become confused with eliminating all expectations of anyone who has suffered. Again: Isn’t this the whole point of being a nation? To rise above your challenges and own them as part of your heritage, while taking pride in how far you’ve come? I don’t know of any Holocaust survivors who entered a café in Germany or Poland circa 1946 or 1996 or 2006 and blew themselves up to liberate their family’s land or business stolen by the Nazis. Nor do I know of any Holocaust remembrance conferences where the chief subject is hating Hitler and his SS and the German and Polish and Hungarian people who kept quiet. The subject is remembering the dead and the lost. And how we’ve moved on. Grown, beyond survival. Celebrating the fact that Hitler ultimately failed miserably, precisely because he did not manage to infect his victims with the thing that drove him: Hate. And she is free. Free of hate. And free to see her grandchildren and great-grandchildren flourish in free countries. Marinating oneself or one’s nationhood in suffering, even if it is legitimate and documented, is not the way to gain freedom. That is the way to stay oppressed forever. Encouraging growth and forward movement is – and has always been – the only way out of a national or individual hole. I would set up a meeting for Ahmadinejad to learn something from my Grandma. But he says she doesn’t exist. Sara, thank you. Thank you. The schmaltzy victims of Durban II are the tools of neo-liberalism, sentimentality the destroyer of reason. please email me ,i am an ex muslim Iranian living in Britain for past 26 years (Thanks to British -French Prime-minister and of course not to forget THE DEVIL JIMMY CARTER in 1979). I would like to ask you and your Dear Grandma few question if i may please? What a wonderful article. Your grandmother is a beautiful women. Marty, you are telling us what the Palestinians should learn from the Holocaust? Well my dear, we are a group of 15 belgians who visited the Occupied Territories last month and we have seen and heard and witnessed how the Palestinians are humiliated ‘daily’ by your nice Israeli army. You aught to be ashamed to steal someone’s land and property and freedom. Go and live near the Wall of Shame and spend a night in Hebron. We have done it and we know what we are talking about. The time we believed all your lies has gone. Wake up and return what is ‘stolen’. reading your very well written article reminds me of Eli Wiesel’s statement, “neutrality helps the oppressor, never the victim. Silence encourages the tormentor, never the tormented.” Thanks for speaking up. It’s good to see ignorance still flowering. The post didn’t claim that no Palestinian feels aggrieved. It explained that grievances are no reason to avoid the hard work of bettering oneself and society. Something, which if you actually did visit the Palestinians, you surely noticed. What have they built with all the aid they get? What was done with the greenhouses left for them in Gush Katif (paid for, in part, by Jewish donors!)? They revel in being “victims”. It’s an essential skill there. That and shooting rockets. I did not argue politics as to which side of the Israeli Palestinian conflict is right or wrong, I simply stated a fact that in this struggle the Palestinian people place their children in the forefront of the struggle thus exposing them to trauma. Perhaps if the Palestinians wanted to shield their children from trauma they would be more concilliatory and less rejectionist of the two state solutions that have been profferred by the Israeli governments. My mother was 5 when she lived through it. My grandfathers died and my 2 uncles, who were 3 and 2 years of age. My mother and grandmother survived living on scaps in the woods. The train that they were on, thank g-d was derailed, with the bombing. I cry as I sit here and write this. What a touching post – thank you for sharing. It is very heart-breaking to imagine what people went through during the Holocaust.